One common question we often hear is, “Has the Bible been preserved or has it been perverted over generations?” Sometimes people will use something that we refer to as “the telephone game.” We are in the 21st century now and the Bible was finished at the end of the 1st century. So how do you know it is trustworthy? So the illustration will go: one guy in the 1st century talked to another guy in the 2nd century, to another guy in the 3rd century, all the way to the 21st century. How do you know that the Bible is true? And so many translations exist today in English—if you look at it, people would assume from the outside, it looks kind of silly that we really don’t even know what the Bible says. I would say both of those assumptions are wrong and can lead you down the wrong path, if that’s really what you believe. But they are great questions to ask. 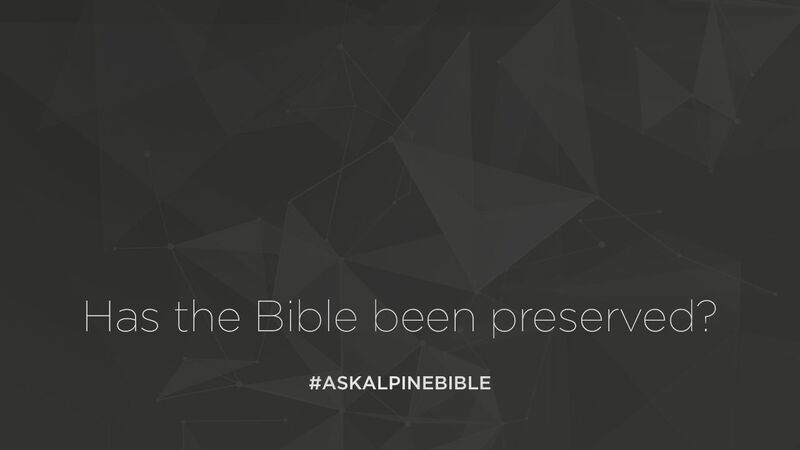 When it comes the preservation of Bible it’s important for you to know that we have 25,000 manuscripts totaling over 1.8 million pages of the Old Testament dating older than Jesus. For the New Testament, within the first generation after it was complete. So when we talk about translating the Bible, we’re not taking a 20th century translation to translate into the 21st century. We’re not taking the 13th century translation to translate into the 21st century. We’re going back to the early manuscripts and translating them into English today. We have that available. In fact, there are people called textual critics who dive in the textual criticism to look at the early manuscript, to translate for us into English today. The reason we have so many different translations in English isn’t because we don’t know what’s in the 1st century text of the Bible. The reason we have so many translations into English is because a translator always has to answer the question: what type of translation would you like to conduct? There are word for word translations, there are thought for thought translations, and there are paraphrase translations. Anyone who’s from another culture or another language knows you can’t always translate exactly word for word into another language. Which is why if you’re interested in knowing what the first early translations of the Bible say, I would encourage you to pick up an interlinear Bible. It will take the early language and it will put the English word right below it. What will see as you read across in English is that the sentence structure doesn’t work in our language. So what a translator has to do as he translates from the original language in our language today, is decide how to do that. A lot of translations are word for word. Those will be the King James Bible, the New American Standard Bible, or the New King James Bible and are considered word for word. Some are thought for thought. The NIV translation and the New Living translation are thought for thought. They take some of the difficult work of understanding a word for word translation out for us. Meaning, if you read Hebrew idiom, in the Hebrew language, sometimes we won’t understand it. But, a thought for thought translation can rephrase that in an English idea we can understand it better. There are even translations that bridge that gap. The English Standard Version, the ESV, is between a thought for thought translation and a word for word translation. Sometimes there is even the paraphrase translation. A paraphrase translation like The Message, where originally written for children. A father wanted his child understand the Bible better, and so he gave him a paraphrase translation of scripture, It began to teach his child about the Bible. I will confess, sometimes, I will read a paraphrase translation. It even works as a good commentary on Scripture. When I get to places in the Old Testament, especially genealogy, that I just wanna breeze through without getting to the nitty gritty of it, I’ll read a paraphrase translation. But for the most part, I like to read a word for word translation, to best understand what the original Greek said, what the original Hebrew said, in the Bible. I would encourage you, if you’re worried about translations: grab a few different ones. Compare them. You’re going to see that they are not different. There are different translations styles but they say the same thing, because they are related to the original Greek and Hebrew text. I hope that helps you in your study. God’s word has been preserved and that’s important for us.